Use the form below to inquire about Traditional Homestay at Valathoor . Use the form below to reserve for Traditional Homestay at Valathoor . Expect a homely touch at this traditional Homestay at Valathoor, a simple bungalow & independent huts to stay in! Located in the inner reaches of Wayanad District, this traditional Homestay at Valathoor can take you back in time. Ever remember those visits to your friends’ houses in faraway places? The simplicity, the joy, and serenity of being close to home are the USP of such visits! Being at this Homestay is no different. If you have ever felt the need to reconnect with nature, this is the perfect spot for you to be one with nature. For those who want to avoid the cacophony of the cities, this cozy Homestay is a welcome change from your regular lives. With well-appointed rooms, which are spacious and comfortable, the Homestay also boasts of two tree houses. The tree houses at this Homestay have the rudimentary amenities along with attached washrooms. They are the perfect getaway for anyone who wishes to be welcomed by nature, at her very best, right at their doorstep. A breathtaking visage greets you from the tree house as you gently ease into your bed, sip on a simple tea, and curl up with a classic read one too many times. This traditional Homestay at Valathoor is all about being one with nature. There are no modern distractions here like TV or Wi-Fi in the rooms. The homestay is all about taking a break from the regular and mundane, and the hosts make it an experience to live for. The food too is authentic, home-cooked, traditional Kerala food! All meals, vegetarian and non-vegetarian, are served in their rustic dining room. As part of the family, while your stay lasts here, you will get to be a part of the big family eat out experience with the other guests around. Dinner and lunch are charged extra. There is no room service and no televisions. The Homestay is located right within the heart of Wayanad itself and thus provides an opportunity to all nature lovers and trekkers to explore the thickly wooded rainforest at their own leisure. 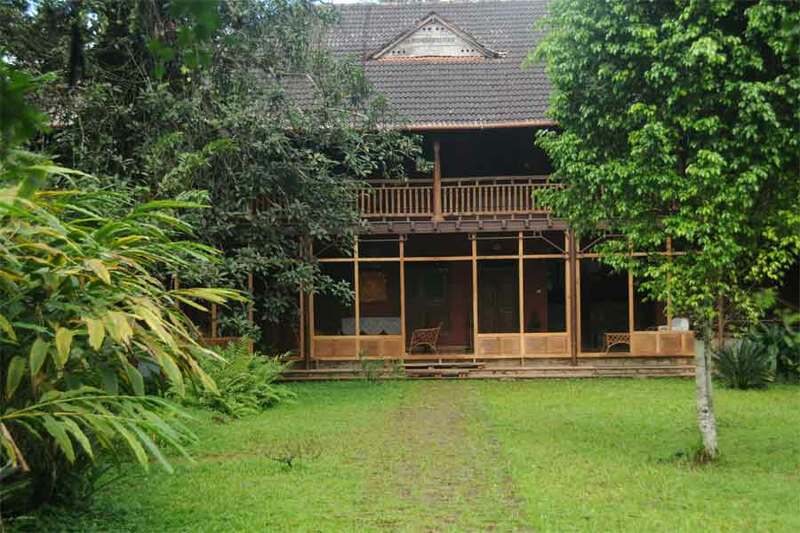 The Homestay offers to arrange for treks, nature walks, and sightseeing tours upon request. The immense depths of the forest are a welcome break from the monotony and with experienced guides accompanying you, the experience is nothing short of bliss. The Wayanad Wildlife Sanctuary is also a must see for all tourists as it is famous for its tigers and leopards amidst other flora and fauna. Campfires are another breathtaking addition to the list, and it is surreal watching the stars as evening drops down, as you rest and relax right next to the campfire, while the team at the Homestay ensures that you feel right at home. This Homestay is located 284 km (appx 5.5 hrs) from Bangalore. From Bangalore, head down to Mysore and from there take the NH766 to Guridiupete, followed by a sojourn through the Berambadi State Forest and then the route through Nenmeni and Padivayal to reach Rippon, and from there head on to Valathoor, where the home stay is located. Kozhikode is at a distance of 86 km (appx 2.5 hrs) from here. This beautiful Homestay is situated in Valathoor, Rippon, Kalpetta district, Wayanad. Staying here is an experience in itself. This old ancestral home built in the typical Kerala style on a coffee plantation has spacious rooms with attached bathrooms. The property has two tree houses too with all basic amenities, attached bathrooms, and the breath-taking views from the balcony! Perfect for couples, these tree houses are at their best during the monsoon. It seems as if the clouds are greeting you at your doorstep and instantly you are transported to a different world. An ideal setting for nature lovers and those who want some solitude with only nature as a companion, this is a great place to curl up with a book and a hot mug of coffee or tea. The food available here is authentic Kerala cuisine with meals served in the rustic dining room near the main house. Room service is not provided and guests are expected to adhere to the meal timings. Experience the bliss of being freed from the bane of connectivity to the world since there are no televisions and Wi-Fi on the property. The perfect way to enjoy the silence without the jarring noises from the telly or the pinging of messages!